Your front entrance is important, as it is often the centerpiece of your home. A thorough cleaning, updated painting, color and hardware can make a powerful first impression on visitors to your home. Once that project is out of the way, you may want to tackle some seasonal decorating to enhance your newly updated entrance. One of the many aspects of fall that we can’t help but love is the colors. There’s something about the deep reds, vibrant oranges and golden yellows that elicits our desires for everything from sweaters and scarves to slow cooker meals and seasonally flavored coffees. To enhance your enjoyment of everything fall, we suggest spending a little more time on that entrance to incorporate some seasonal elements. Our first suggestion is to invest in some planters that you can use year round. If you have the space, consider using urns because they’re versatile and add some height to entrance. The extra height is visually appealing and ensures that your entrance does not swallow up your plants as they balance out the proportions. Urns come in a variety of styles and materials so you’re sure to find something that will work within your budget. For those of you working to be financially conservative, we suggest opting for a plastic version and weighing it down with sand or stones to ensure that it won’t tip over and crack (and thus compromise your plants). Our final recommendation relative to urns is to opt for black. A black urn is preferable for planting because it will almost always provide a beautiful complement to the other colors and materials that make up your entrance. As you head to the greenhouse to purchase plants to fill those urns, we have to insist on at least a couple of mums. These seasonal gems are a must have and can be mixed or matched and will always be a beautiful addition to your outdoor decor. While the mums often steal the show, we must also suggest some other favorites such as ornamental grasses that always create some interest in your planters or greens, such as cabbages and kale. These choices offer an unexpected contrast to the brilliant colors of the mums and add to the visual appeal of your arrangement, keeping your eyes moving about. 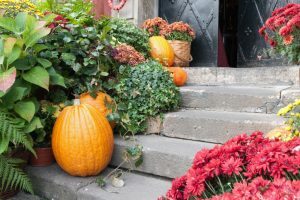 Last but certainly not least, pumpkins, squash and decorative gourds can be used to accessorize your planters and be worked in around stairs, railings or mixed right in with your seasonal landscaping to bring some color and interest to your home. Fall is often a great time of year, filled with fun, family friendly activities and nearly indescribable natural beauty. We hope you get out and take advantage of special time of year and enjoy decorating the entrance to your home to further enhance your enjoyment of the season. Most people bring some resolutions into the New Year that they hope to fulfill. Often, improving diet, exercise and weight top the list of those resolutions. Eating healthier doesn’t mean you have to resign yourself to smoothies and celery sticks, though. There are many options available when you’re looking for ways to eat better and improve your diet. The recipe we’re sharing with you is full of fresh herbs, vegetables and whole grains. Perfect for lunch or as a side dish with dinner, we think this farro salad recipe from Giada De Laurentis will give you a whole new – and delicious – perspective on what it means to eat healthier. 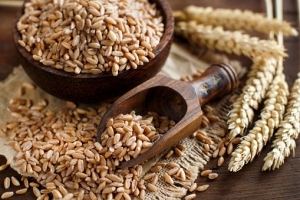 Combine water and farro in medium saucepan, and add salt. Bring to boil over high heat, then reduce to medium-low and cover. Simmer for about 30 minutes, or until farro is tender. Drain well, and then cool in a large bowl. Next, add tomatoes, onion, chives and parsley to farro. Toss to combine. In medium bowl, whisk together garlic, vinegar, salt (to taste), pepper and olive oil. Add this vinaigrette to the farro mixture and toss to coat thoroughly. You may refrigerate this salad overnight. Bring to room temperature before serving. At Family Danz, our New Year’s resolution is simple – we want to keep working harder to provide you with the very best HVAC services in the area. Our goal is to never stop improving on what we offer to you, our valued customer. No matter what your comfort need may be, you can count on us to help. Just call 518-427-8685 and we will be more than happy to assist you. When you’re trying to run a business, you know that having a controlled climate is important so that your employees are productive and your clients are happy. Maybe you already rely on Family Danz for your personal home comfort needs, but did you know we can help you keep your business warm all winter long as well? We provide the same professional HVAC services to businesses as we do for residential clients, including heating system installation, maintenance and repair, as well as fuel oil delivery. In a survey conducted by Software Advice, employees of various companies were asked about their preferences regarding office temperatures. Half of the employees surveyed were unhappy several times a month with the temperature of their office, and 56 percent said they were too cold in the winter. Most surveyed felt that the temperature of their office made a difference when it came to productivity levels, and most preferred the temperature to hover around 71 degrees (72 for women, 70 for men.) It could be assumed, then, that your employees will benefit from better climate control – and you’ll benefit from choosing a company that helps meet those needs and helps your employees stay productive and satisfied. No matter whether you have a boiler or furnace heating system at your business, our commercial heating service team is ready to help you keep your employees and clients warm, no matter how cold the winter gets. We take pride in offering our commercial customers the best, most efficient heating systems available for their businesses or organizations. And, our highly trained technicians can maintain and service most commercial systems, so you’ll never have to worry about not getting the help you need when you call Family Danz. And, as business owners ourselves, we understand that downtime is costly for businesses or organizations. That’s why we strive to ensure that your commercial heating service – whether it’s repairs, maintenance or installation – is completed in a timely fashion, to your complete satisfaction. That way, you can get back to your business with as little downtime as possible – surely something your employees and customers will appreciate! Family Danz is pleased to offer commercial heating services throughout the Albany, NY area. If you’re in need of commercial services for your business or organization, and you’d like a Family Danz representative to contact you, please visit our commercial heating page and fill out our convenient contact form, or feel free to give us a call at 518-427-8685. Your employees and clients will be toasty warm all winter long, when you choose us to help keep your business comfortable. It’s been one of the coldest winters on record here in Schenectady, N.Y., and your furnace has probably been working overtime. When your system is working hard to keep your home warm and cozy, the chance that you could experience a breakdown increases – especially if your system is older or hasn’t been maintained in a while. If you’re faced with a heating system emergency in your Schenectady, N.Y. home, you can trust Family Danz Heating & Cooling to help. Our highly skilled technicians have been specially trained to thoroughly evaluate your heating system repair needs and find the best solution to help make your home as comfortable and energy efficient as possible. At Family Danz, we always treat our customers like family, which is why we work hard to help you with your heating repair needs. We arrive at your Schenectady, N.Y. home on time are able to address any questions or concerns that you may have in a professional, courteous manner. What’s more, Family Danz technicians have access to the most advanced diagnostic equipment, instruments and tools to help resolve your heating system problems more quickly and effectively, saving you time and money. We service all makes and models of heating system equipment, and we pride ourselves on providing prompt service, especially to those most in need without heat. For emergency repairs, we are available 24 hours a day, including weekends and holidays – because we know emergencies can occur at the most inconvenient times. Don’t suffer with a chilly home or compromise you and your family’s safety with a heating system that isn’t operating properly this winter. When you need heating repairs in a hurry in your Schenectady, N.Y. home, Family Danz Heating & Cooling is ready to assist you. Simply call us at (518) 427-8685. If you think home heating oil has to be detrimental to the environment – think again. That’s because now, there’s Bioheat, a traditional home heating oil that has been blended with biodiesel. How is it a cleaner and renewable fuel choice? Read more to learn about Bioheat and how you can use it in your home. To first understand what Bioheat is, it’s important to know what biodiesel is. Biodiesel is, according to the Bioheat website, “a renewable energy resource made domestically from fatty acids found in vegetable oils, recycled restaurant oils and other natural resources.” Bioheat generally blends from 2 percent to 5 percent biodiesel with their traditional home heating oil. You may be thinking, “Bioheat sounds great for the environment, but is it really a good fuel choice?” Well, aside from the benefit to the environment, there are many advantages to the consumer as well. First of all, it provides a cleaner, more complete and more efficient burn, which means you’ll get more for your money. And, because of its chemical composition, it can extend the life of your equipment. Plus, it’s produced domestically from American agricultural or recycled content. When you choose to switch to Bioheat, there is no costly equipment retrofitting or modifications when you switch to a Bioheat B5 blend. Bioheat performs like your current fuel oil, and the costs are similar to traditional heating oil. And, Bioheat complies with the industry’s quality standard guidelines (BQ-9000 and ASTM), so you know you’re always getting consistent, quality home heating oil. If you think Bioheat is a good fuel choice for your home, contact Family Danz. Aside from being a full-service HVAC contractor, we also provide fuel oil delivery all throughout the Capital District. Call us today at (518) 427-8685, or fill out our online form to schedule your next home heating oil delivery and to ask about our convenient payment options. If the air conditioner in your Albany, N.Y. home was made before January 1, 2010, there is a good possibility that it contains refrigerant known as R-22, or Freon. According to the Environmental Protection Agency, the reason this refrigerant has since been phased out and replaced with the more environmentally sound R-410A is for the protection of the Earth’s ozone layer. You may be wondering, though, if your pre-2010 air conditioner needs repairs, can they be made? The simple answer is yes, but there are some facts you should know should your system require repair services. First of all, you don’t have to replace your system even if it contains R-22. Part of the EPA’s regulations included the banning of production of air conditioning equipment containing R-22, but that doesn’t mean older equipment can’t be repaired. While the EPA called for this refrigerant to be phased out, they still have allowed reduced quantities to be produced in order to make repairs to Freon systems. 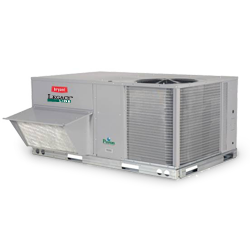 Pre-2010 systems can still be repaired, and components such as condensing units replaced. If you’re in a situation where the air conditioner in your Albany, N.Y. home is in need of major repair, however, you might wish to consider investing in a new unit that uses R-410A. Why? R-410A is a more efficient, more Earth-friendly refrigerant. You might decided that it’s worthwhile to purchase a more energy-efficient system so you can save energy and cut down on your utility bills. Or, you might want to choose something that’s simply greener. And, if you replace your system now, you won’t need to worry about the high cost of repairs using R-22 – the cost of the refrigerant will only increase as the supply dwindles. If you do decide that you’d like to replace the old R-22 unit in your Albany, N.Y. home, Family Danz can help you find an air conditioning system that can help you save on your utility bills and is perfect for your home and your lifestyle. We can also help you find rebates and incentives on certain high-efficiency AC equipment, to help you save money now and in the future. If you would like more information on high-efficiency air conditioning systems or any of our other products services, call us today at 518-427-8685. When you’re considering purchasing a new furnace for your Albany, N.Y. home, the chances are pretty good that you’re looking not only for something within your budget, but also a furnace that will help you save money on your utility bills. Your furnace plays a big part in the overall energy efficiency of your home, and the Average Fuel Utilization Efficiency, or AFUE, of your furnace directly determines how much you’re spending on energy in your Albany, N.Y. home. AFUE is the standard rating system for measuring the energy efficiency of furnaces that run on oil and natural gas. AFUE is shown as a percentage that tells the amount of fuel used to heat your home, and the amount that’s wasted. The higher the AFUE percentage, the more efficient your furnace. Today’s furnaces can bring your Albany, N.Y. home’s AFUE rating up to 96 percent or better. That means if you have an old, 60 percent AFUE furnace, you could save nearly 40 percent on your heating costs when you replace it with a new, more efficient furnace. That’s a big deal, when you consider the high cost of utilities today! This winter has been a tough one all throughout the Albany, N.Y. area, and beyond a doubt, your furnace has been working overtime. It comes as no surprise that your fuel bills are probably higher than normal. But, if your utility bills have really gone through the roof this winter, and your furnace is more than 10 years old, the chances are you’re not getting the energy efficiency you need from it. If that’s the case, the time might be right to call Family Danz and discuss your options. We can help you choose a furnace with the right AFUE for your Albany, N.Y. home and your needs. We sell Bryant® furnaces, so you know you’re getting one of the best brands on the market, with the highest efficiency ratings. Let us help you find the best furnace for your home. Family Danz Heating & Cooling is a full-service heating and air conditioning contractor, offering sales and service all through the Capital District of New York State. If you would like more information on high-efficiency furnaces or any of our other products services, call us today at 518-427-8685. At Family Danz Heating & Cooling, all of our customers are a part of our family. And as family, we want to make sure everyone has a home that offers them the solitude of safety and security. Winter has returned throughout the Capital District of New York State as it does this time every year. Yes, we know that‘s not news; you‘ve probably already noticed the snow on the ground and had to turn up the furnace. But it’s because of that winter cold that area residents have now created a situation that causes concern for safety. It’s that furnace, sometimes running constantly on those really cold days, that is suddenly not only a major boon to personal comfort but a possible threat to the family at the same time. Creating that heat takes considerable combustion on the part of the furnace, and that poses the possibility of accidental fire. But don’t fret — with the encouragement of your friendly Family Danz technician, you can rest assured you are as safe as can be in your home. We’ll assume you already had your fall tune-up by our experienced crew to make sure the furnace was in perfect working order. If you didn’t, however, it certainly isn’t too late to give us a call for a check of the system … we can do those any time, and the peace of mind is worth it. When you first turn on the furnace in the fall, you will smell the unmistakable aroma of burning dust inside the ductwork. That’s normal and happens every year on that first time. It burns away quickly and will be fresh the rest of the cold season, hopefully. But if that smell comes back later, then there is a problem. That’s the time to give us a call. If you smell gas, on the other hand, we don’t want you to call us — immediately call your local gas company’s emergency number or 911 if you don’t know it because that is a serious problem. 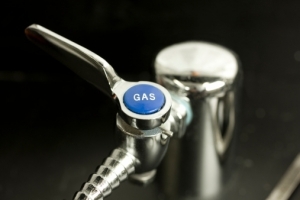 Gas leaks are toxic and can cause explosions, so they need to be addressed immediately by emergency personnel. Always make sure both your smoke detector and carbon monoxide detector have fresh batteries in them and are working properly. Keep combustible items and chemicals away from the furnace, and make sure you don’t use the furnace area for catch-all storage of laundry, garbage, toys, or any other clutter that will make it hard to get to in an emergency. The simplest but one of the most effective ways to keep the furnace safe is to change the filter regularly. Keep it clean and keep all of that dust and dirt from entering the furnace, and it will add years to its life at the same time. If you are worried about your furnace not functioning as safely as it should, give us a call. We will inspect the filter, electrical components, thermostat, air flow, air fuel mixture and heater exchanger, making sure everything is running right without fear of fire nor cracks for nasty gas or carbon monoxide to be released into your home. Family Danz Heating & Cooling is a full-service heating and air conditioning contractor, offering sales and service all through the Capital District of New York State. If you would like more information on any of our services, call us today at 518-427-8685.